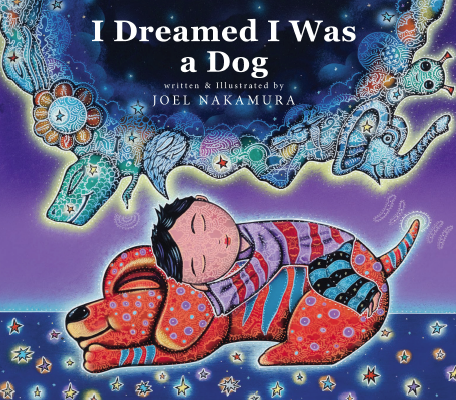 As part of the 2018 Year of the Dog celebration at the Japanese American National Museum, award-winning author and illustrator Joel Nakamura will read from his acclaimed new children’s book, “I Dreamed I Was a Dog” (Leaf Storm Press). The book will be available in the JANM Store, and Nakamura will sign copies after the reading. All ages welcome. The 2018 Oshogatsu Festival will be held on Sunday, Jan. 7, from 11:30 a.m. at JANM, located at 100 N. Central Ave. in Little Tokyo. For more information, call (213) 625-0414 or visit www.janm.org. Nakamura’s vivid, colorful illustrations transport readers on a magical journey that begins as a young boy falls asleep and dreams that he is a dog. Populated with animals and beautiful scenes of the natural world, the story shows the interconnection between all creatures in the vastness of the universe. A perfect bedtime story for readers of all ages. Publisher’s Weekly said, “Using a Schopenhauer quotation as inspiration and epigraph (‘The universe is a dream dreamed by a single dreamer where all the dream characters dream too’), Nakamura languidly traces a boy’s ever-evolving dream. The boy begins the night as a ‘dog with red fur and purple spots, chewing on a giant bone,’ but soon transforms into a dinosaur (the red dog is now cast in a best friend role), train, cloud, and more. Nakamura is known for his unique style: a blend of folk art and sophisticated iconography rendered in a neo-primitive technique. He is chosen for many of his commissions for his knowledge of tribal art, mythology, and for his ability to convey stories and information in an intricate and engaging manner. His first children’s book, ‘Go West!,’ was the National Book Festival’s selection from New Mexico, the 2015 Gelett Burgess Children’s Book Award winner (Best Writer/Illustrator, Gold Medal), the 2015 Moonbeam Children’s Book Award winner (Best Illustrator, Silver Medal), and the 2015 USA Best Books Award winner (Best Hardcover Nonfiction Children’s Picture Book). 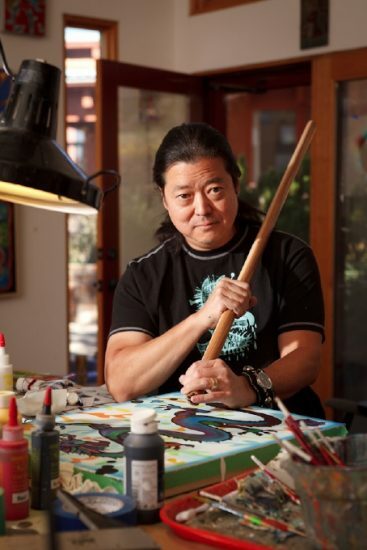 Nakamura’s ability to render humanity in such primal, edgy hues has captured the attention of clients like Time magazine, U.S. News & World Report, and The Los Angeles Times. His paintings have enlivened the pages of many other books and publications, as well as the 2002 Winter Olympics opening and closing ceremonies programs. He has been profiled in Communication Arts, Step Inside Design, Confetti and Southwest Art magazine. Originally from Whittier, Nakamura now resides with his wife and children in Santa Fe, N.M. Leaf Storm Press (http://leafstormpress.com), an award-winning, independent book publisher based in Santa Fe, is dedicated to publishing works with unique literary, artistic, social or cultural significance.